Scale for very small measures? Re: Scale for very small measures? I use a reloading scale that measures in grains. 15.43 grains=1 gram. Electronic scales used by ammunition reloaders measure very small increments. 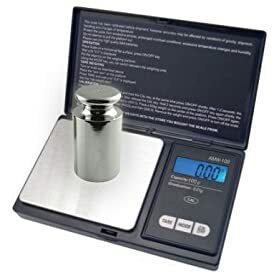 American Weigh AMW-100 Silver Precision Digital Pocket Scale 1543 x 0.1 grain and 100 x 0.01 gram With 100 Gram Calibration Weight for $16.99. I have what thirst_monk posted, and like it! Oh, do I have a story about a scale that measures grains! If you prefer to shop locally, try a head shop (you know, stores that sell equipment made for perfectly legal tobacco use). Awesome - thanks everyone! My dad used to be an avid re-loader, he may even have one laying around. Looks like a nice deal. And the latest Amazon reviewer tells us he uses it for weighing drugs. Oh No!